Today, motion activated cameras are used by scientists, game wardens and sportsmen to photograph wildlife and monitor their movements. 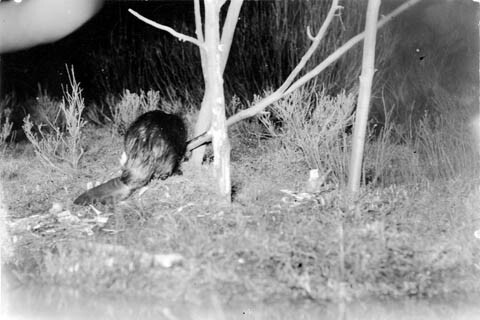 These photographs can provide an accurate account of types and numbers of animals visiting a particular spot. Over the course of several weeks or months, the images can also be studied to determine the habits of individual animals. Game cams are used by the Wyoming Department of Transportation (WYDOT) to prove the effectiveness of several animal underpasses/overpasses installed along wildlife migration corridors to prevent motor vehicle collisions with big game. Cameras have captured deer, antelope, elk, coyotes, bobcats and even moose using the tunnels. So reads the words etched over the entrance of the old gymnasium on the campus of the University of Wyoming. This fall, UW is working towards the completion of Phase I of a renovation of Half Acre Gym on campus, which included the demolition and rebuilding of half of the historic building. The west half of the building was saved and is being remodeled, along with the new east portion, to house modern fitness and wellness facilities. Half Acre Gym soon after completion. You can see a corner of the practice field in the lower right of the photo. The original entrance and western half of the building (left side of the photo) is being remodeled. The eastern half has been demolished and rebuilt. When Half Acre was first opened in 1925, it was a state of the art facility. One of the largest indoor university facilities in the nation, its arena covered about half an acre, thus the name Half Acre Gym. 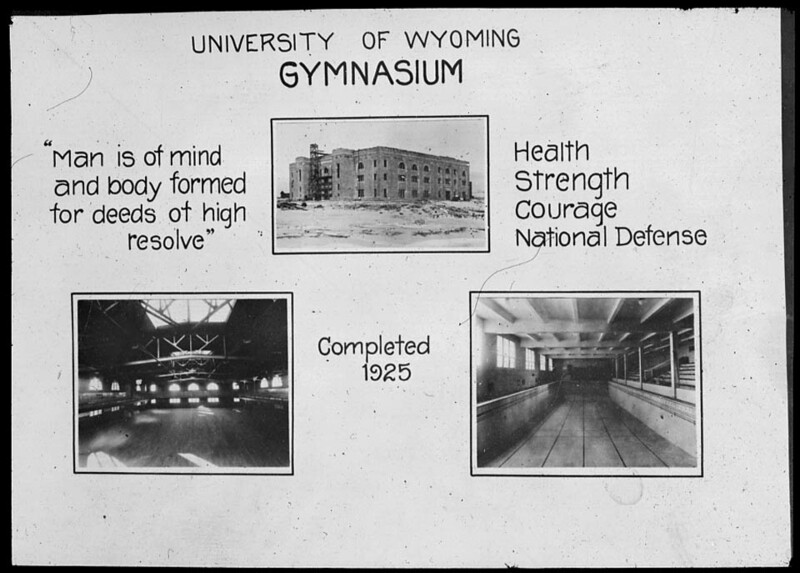 The building was home to the UW/Laramie National Guard Armory as well as the athletics program until the field house was completed in 1951. 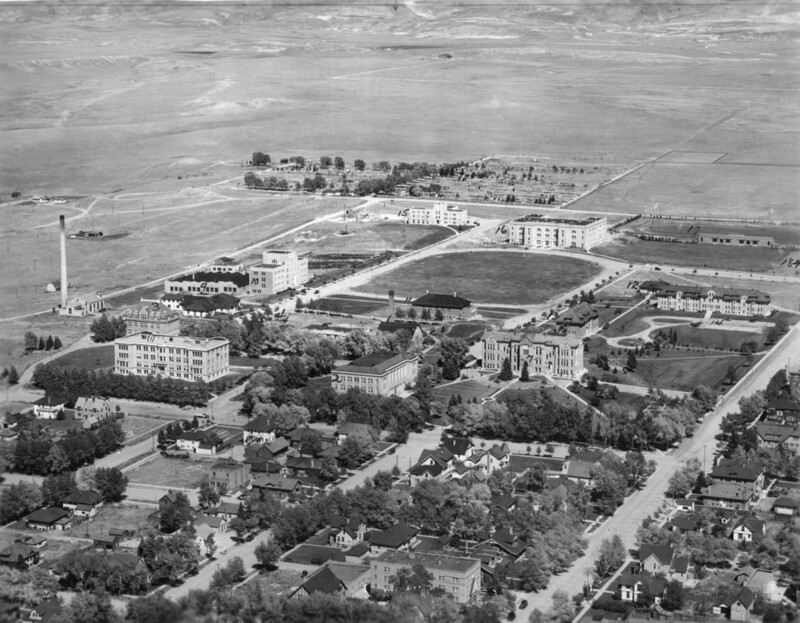 Aerial view of the University of Wyoming campus in 1931. Half Acre Gym (16) is the large building located on the very edge of campus at the top of the shot, just to the left of the stadium and athletic fields (17) where the student union now stands. The following images are part of a lantern slide presentation on the then current and future prospects of UW, created in the late 1920s. 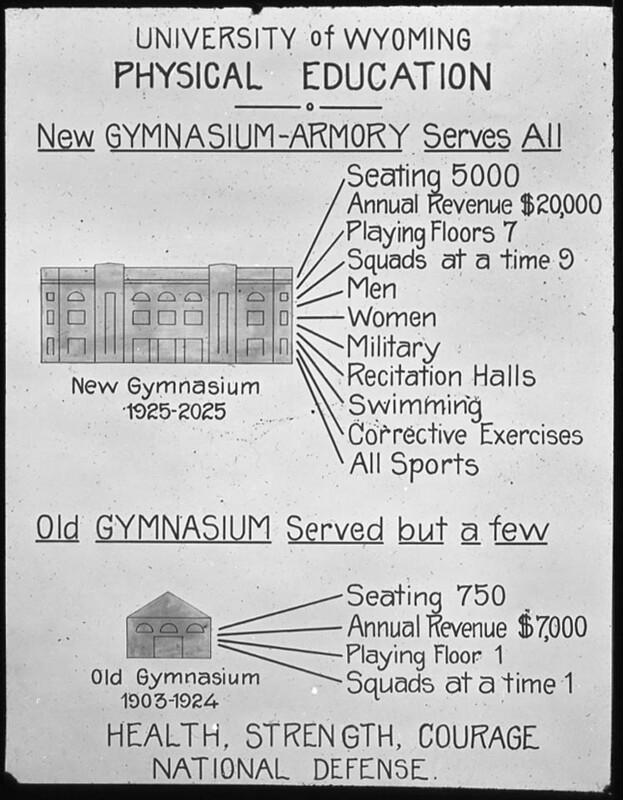 Check out the projected lifetime of the “new” gymnasium. It looks as though at least half of the building will make it to 2025 and beyond. Considering how far exercise and sports medicine has come since 1925, 89 years isn’t anything to sneeze at either. The slides themselves are 4 inches by 3.25 inches and made by sandwiching the emulsion layer (the gelatin layer that contains the image) between two pieces of glass. This would then be projected onto a screen or wall for an audience using a candle or later a light bulb. Eventually, glass would give way to celluloid film and the slides would shrink to the familiar 35mm slides before being replaced entirely by digital presentations. 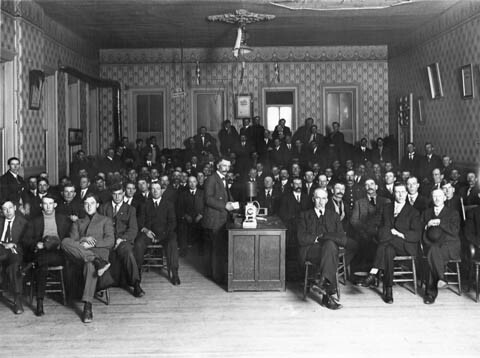 A group of men gather in the Woodmen of the World Hall to view a lantern slide presentation. The contraption on the table is the lantern slide projector. On September 4, 1888, George Eastman received a patent for his box camera. Photography was by no means a new concept, but Eastman’s new invention made it a fun and reasonably affordable hobby for the masses. 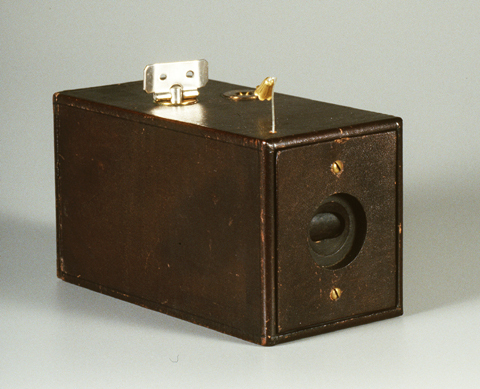 An early Kodak box camera. The thumb screw advanced the film. With this simple wooden box, anyone could now take a picture and be fairly certain of the results. For $25 (about $640 today), you could purchase the camera which was pre-loaded with 100 frames of film. Eastman had developed this paper based roll film a few years early, revolutionizing photography and paving the way for a transition from fragile, heavy glass negatives to light, flexible celluloid based film (which he introduced in 1889). The cameras were marketed with the tag line “You press the button, we do the rest.” And they were true to their word. The cameras were simple and truly “point and shoot” — no focusing, no adjusting. Once all 100 frames were used, the entire camera was returned to Eastman Kodak where the negatives were developed and pictures printed. The camera, loaded with new film, was sent back with the prints. This meant that budding photographers wouldn’t need to master the darkroom developing techniques or bother with finicky chemicals. Photos taken with these early cameras are fairly easy to spot since they produced round images. The images from first generation cameras (1888) were 2.5 inches in diameter and second generation (1889) cameras 3.5 inches in diameter. 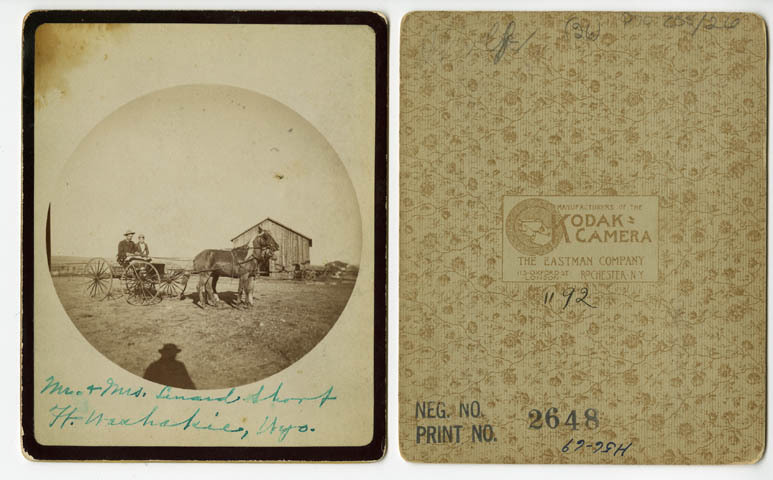 The photos produced by the early Kodak box cameras were round. This one is from a 2nd generation camera. You can even see the photographer’s shadow! Every so often, you come across an item in the collection that is so unusual it makes you stop and stare. This is one of those items, both for its subject and technique. Red Cloud and his wife, Pretty Owl, in 1888. Cyanotype on silk. 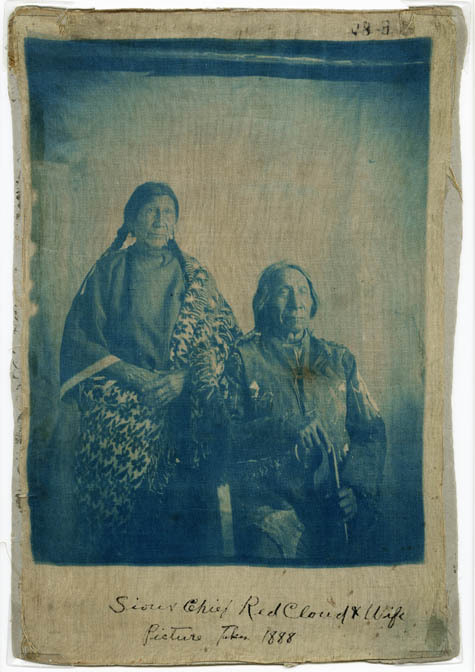 In 1888, Ogalala Lakota Chief Red Cloud and his wife, Pretty Owl, sat for an unnamed photographer. He would have been about 66 and she about 53. The two were married around 1850 and it was said that she was very jealous of other women vying for his attention and was the undisputed head of the household. The Treaty of Fort Laramie at 1868 brought an end to “Red Cloud’s War.” The US Army agreed to abandon forts in Northern Wyoming and build agencies for the tribes in the region. 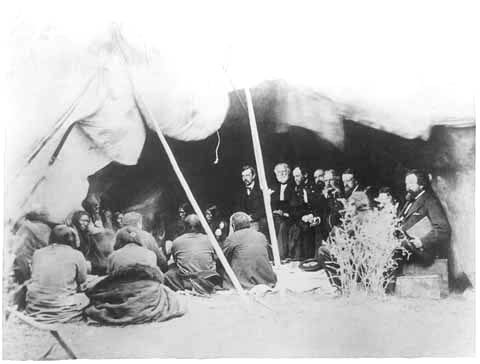 In 1868, Red Cloud participated in the treaty talks at Fort Laramie which lead to the US Army abandoning the forts, including Fort Phil Kearny, in northern Wyoming. Red Cloud went on to lead the Ogallala Lakota as chief from 1868 until his death in 1909. The treaty also stipulated that the Lakota be confined to an Indian agency, the forerunner of the reservations. It was named in Red Cloud’s honor and moved three times before it was renamed the Pine Ridge Agency and permanently located in South Dakota. This particular type photograph is called a cyanotype and was printed on what appears to be silk. Cyanotypes are made by treating paper with potassium ferricyanide and a ferris salt. The negative is placed directly on the prepared paper and exposed to UV light (usually sunlight), which causes the exposed portions to turn a muddy yellow. 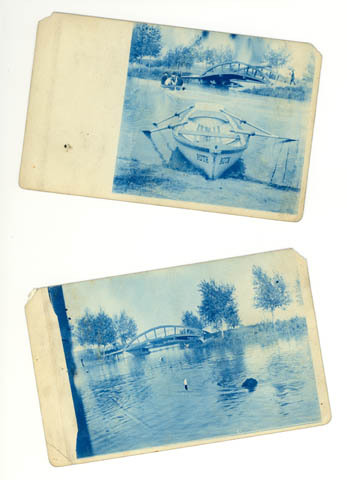 The prints are then “developed” using plain water and the yellow-green become the characteristic blue and the original color of the paper shows through in the highlights. 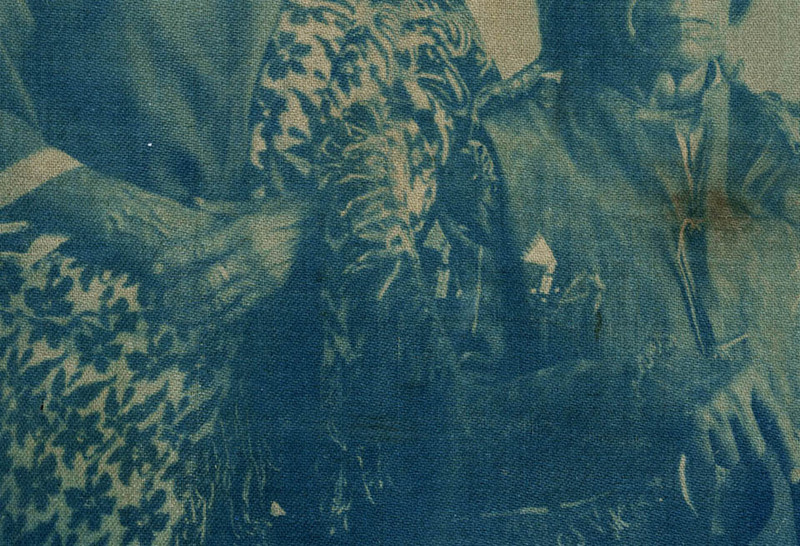 Detail of the cyanotype. The image is crisp and clear, despite the texture of the fabric. The same process was used on fabric for this photograph, a technique which is still fairly popular with textile artists who use natural materials and found objects as well as negatives or transparencies to create their designs. Silk is a favored fabric because of its tight, even weave and smooth texture, but modern cottons are also used. Examples of cyanotypes. These two were amateur snapshots on postcards taken in Cheyenne’s Holliday Park and then printed on postcards. The large dark spot in the lower photo is a dog’s head as it swims toward the camera.